Let’s rewind to last Sunday of November, the beloved British tradition of Stir Up Sunday. Even though my family is not much into Christmas celebration, I adore the anticipation. While our southern neighbour kicked off holiday season with Thanksgiving, I pretended to be British for a day and made a batch of mincemeat. I used Dan Lepard’s recipe and made a luxurious mix of Blenheim apricots, currants, golden raisins, figs, Cortland apples, homemade candied orange peel, and lots of dark rum. 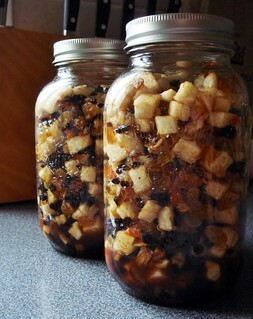 The mincemeat aged patiently in the fridge during the month of December when my life went topsy-turvy. When I took the jars of mincemeat out of the fridge on December 23, the flavour developed into something beautiful that only time can bestow. It took utmost self-control not to eat it directly out of the jar by spoonfuls! I made fussy little pies using J. Kenji Lopez-Alt’s foolproof pie dough. 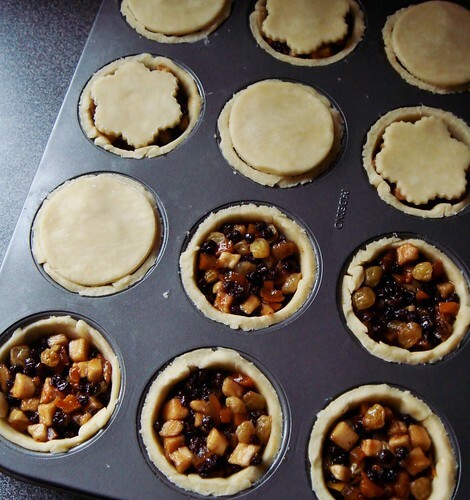 A double batch of 9-inch pie dough conveniently yielded 12 muffin-tin size mince pies when I stamped out circles in 11cm and 6cm diameter. Even a long bake in the oven could not diminish the boozy rummy taste. 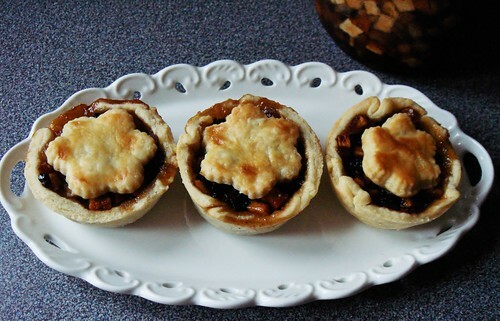 Homemade mince pies are worth all the trouble. Do read up on their interesting history and background of these British treats. Lately sleep is not something I take for granted. When my mind is spinning with a million things on the to-do list, sleep usually takes a backseat much to my coach’s dismay. The night before my last day of work, slumber precluded me. 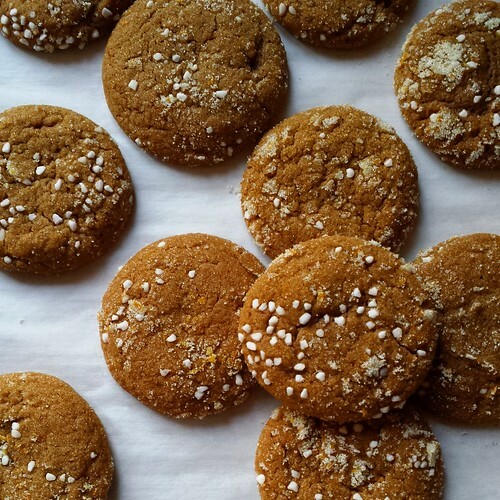 Instead of lying awake in bed, I puttered around the kitchen and made a batch of America’s Test Kitchen Molasses Spice Cookies with Orange Essence as one last hurrah to my office mates who tried so many of my sweet concoctions over the years. It’s amazing to realize that it all started with a New York-style cheesecake back in 2002! I came a long way since. As the recipe promised, this cookie had a lovely balance of flavour and irresistible soft chewy texture. I couldn’t help myself and added a little personal touch with some Swedish pearl sugar on the outside of the cookies. The cookies were shared enthusiastically with my colleagues and we reminisced all the war stories over the years. It was bittersweet that a long journey finally came to an end even when I am facing more exciting adventures ahead. This year I made a point of tackling many challenging baking projects. 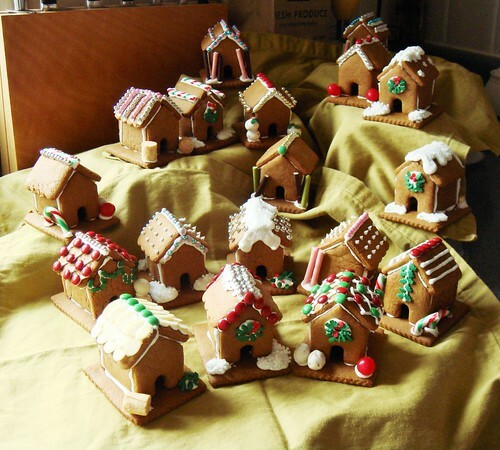 One of which was a village of uniquely decorated mini gingerbread houses. If I think the mince pies were fussy, they were nothing compared to wielding tweezers and piping bag to make these adorable gingerbread houses. Thank goodness a night of relentless effort did not go to waste. The houses brought plenty of ooh’s and aah’s at the cookie swap. I was more than happy to spread a little holiday cheers. 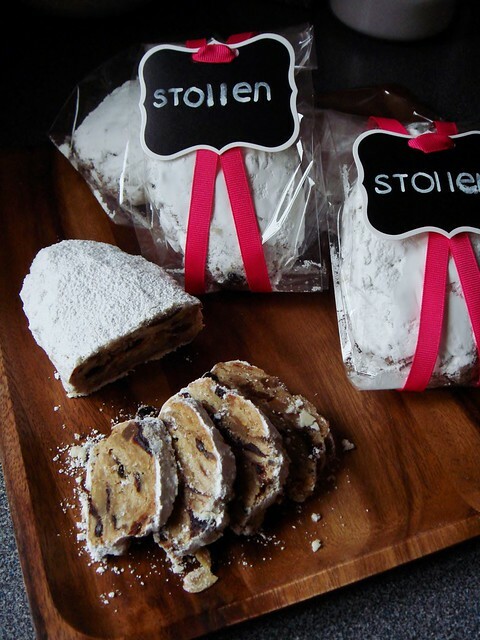 I cannot stress enough how much I love to eat stollens. 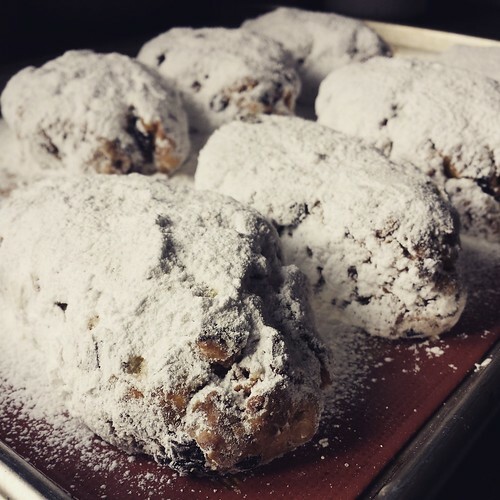 Similar to fruitcake, it can be a divisive holiday treat that you either love or hate. 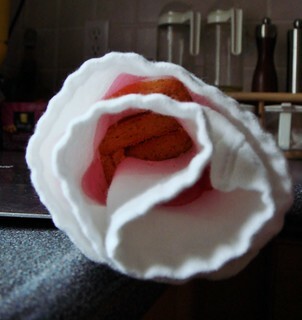 Ever since I discovered the amazing taste of homemade stollens four years ago, there was no turning back. This year I decided to make eight mini loaves, just the perfect size for gifts. The best part? The loaves were small enough that I could easily submerge them in melted butter for extra richness! 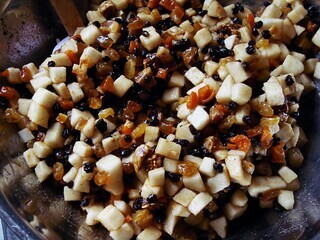 This year I used a mix of rum-soaked currants, sultanas, dried cherries, almond, homemade candied Seville orange peel, and Australian candied ginger. I did not spare any expense and it showed. It made me happy to know my friends enjoyed them as much as I did. 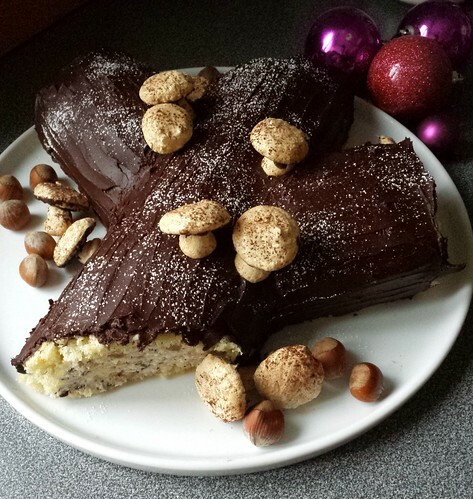 The pièce de résistance of my holiday baking was bûche de Noël (yule log). 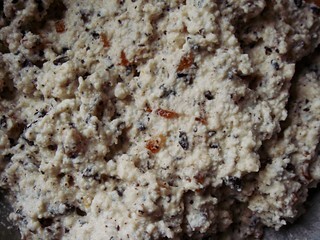 I made one back in 2006, a modern interpretation of this traditional dessert. Among Paris patisseries, it is an intense competition every year to outdo each other. Just look at this video from 2011 and you will understand what I mean. 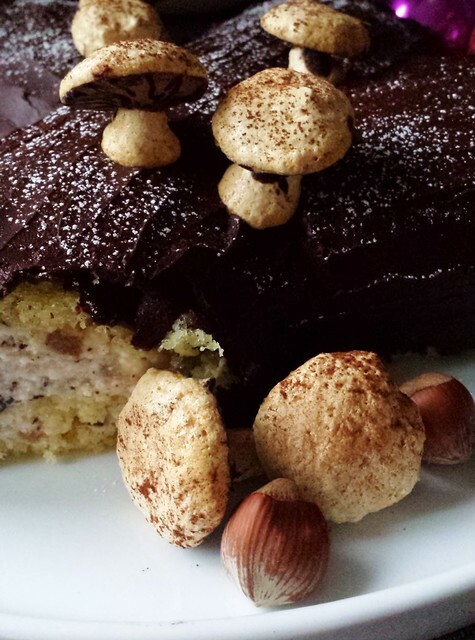 However, there is a rustic charm of one made to look like a tree branch completed with meringue mushrooms. 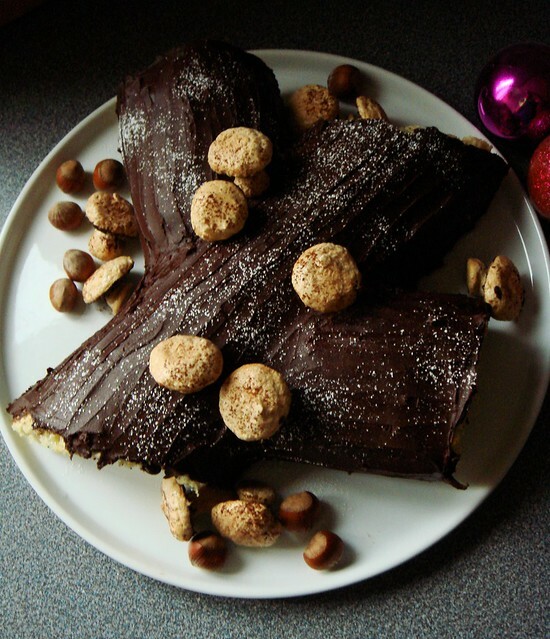 This year I took the cue from David Lebovitz and made his bûche de Noël recipe from My Paris Kitchen. His lightened version is made of genoise, Grand Marnier-infused ricotta studded with candied orange peel, chocolate shards, and dark chocolate frosting. The cake reminded me of cannoli and that was a very good thing. Unfortunately, wrestling with this cake was far from fun. I have yet to master genoise and my inexperience was evident. I overbaked the cake and it was too brittle to roll. My cake broke into several pieces that thankfully the generous filling and chocolate frosting covered up. It helped that the cute meringue mushrooms made the tableau so much nicer! Without much planning, holiday baking turned into an extravaganza that surprised even myself. I hope you had a wonderful holiday season too!